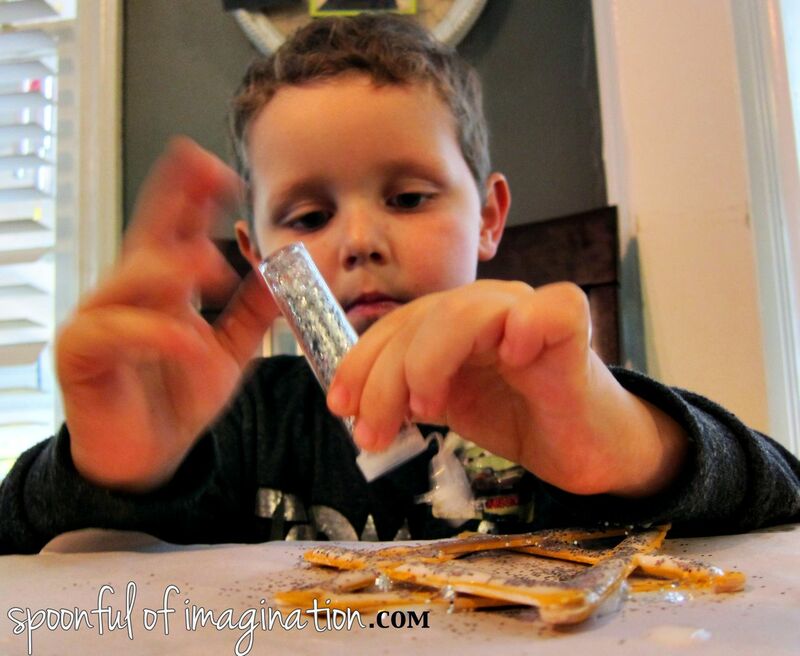 Today, I have 8 easy DIY kid ornaments to share! They are all really cheap and would make presents for grandparents or proud aunts and uncles! I bet you already have the supplies in your house to make a few of these with your kids. 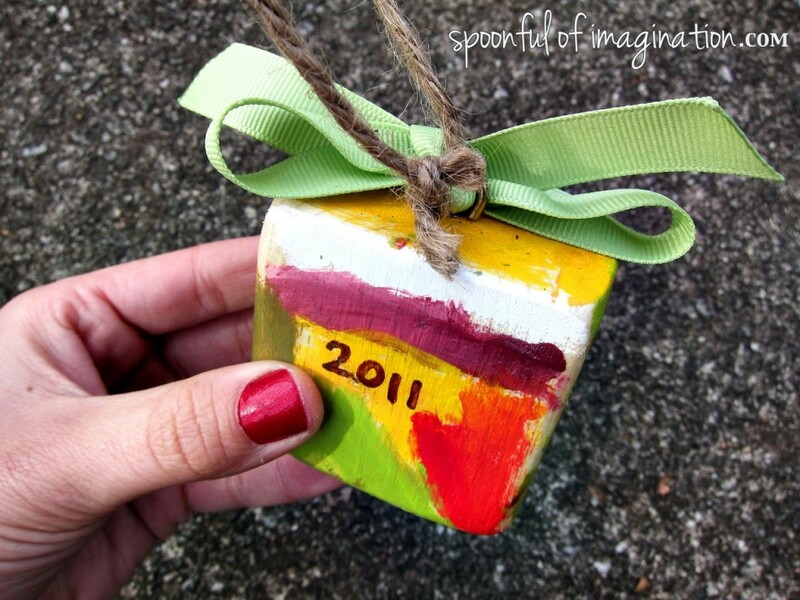 I have gotten some sweet comments on these wood blocks on Facebook, so I thought I would share how to make them. I started with a small piece of wood. It’s cut roughly about 2.5″ x 2.5″. I sanded it down, so the edges and corners were smooth. 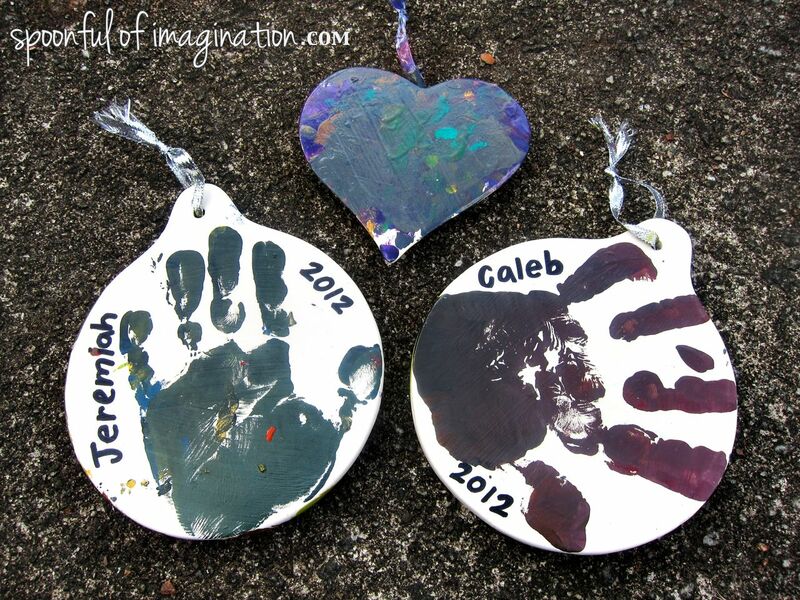 I then let my boys paint their ornament any color they wanted. My sweet girl was only 10 months at the time of this craft, so I painted hers a solid purple. 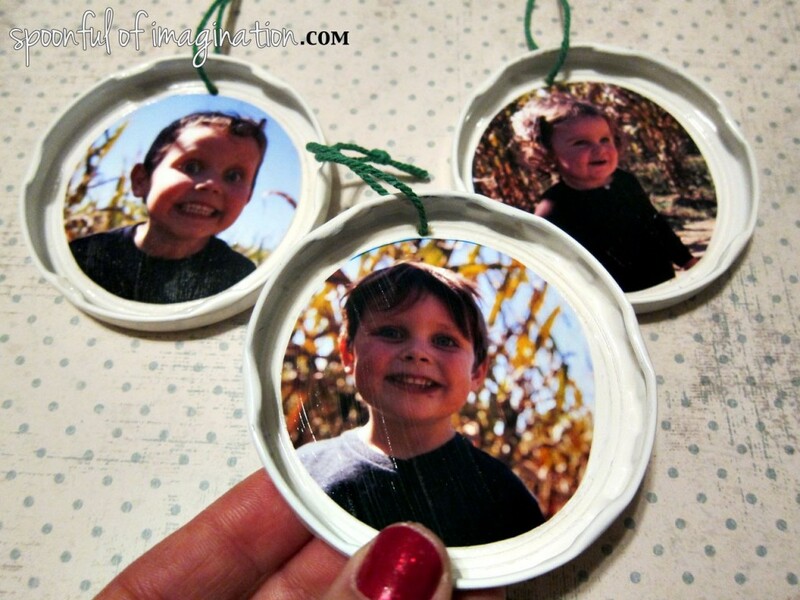 I sized the pictures down on my computer, so they would print a size that would fit on the ornaments. I cut them, rounded their edges, glued them on, and gave the whole block a good coat of Mod Podge. I then screwed a little hook in the top and added ribbon and string, and they were done! 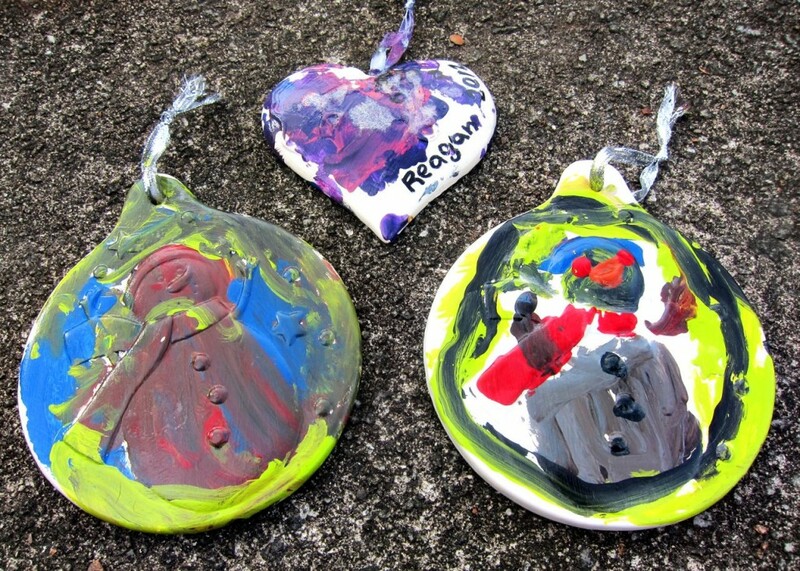 We gave ornaments like these to their grandparents last year for Christmas, and I think they were a hit! 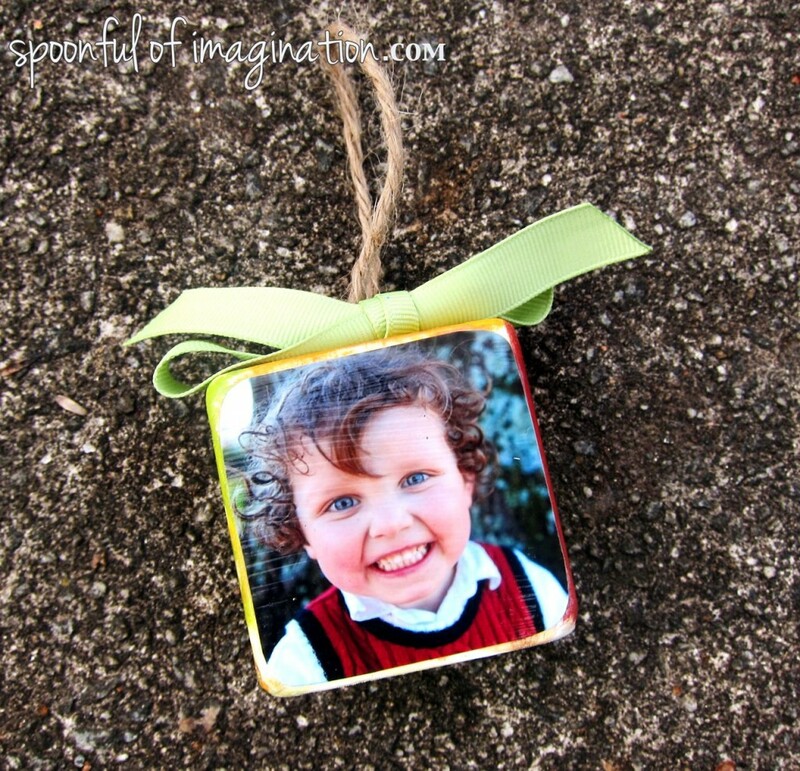 Other ways to use the ornaments are to capture a first year marriage (with wedding pic) or a baby’s first Christmas (with a baby picture). These are both gifts I have given. I love to add a personal touch to gifts. 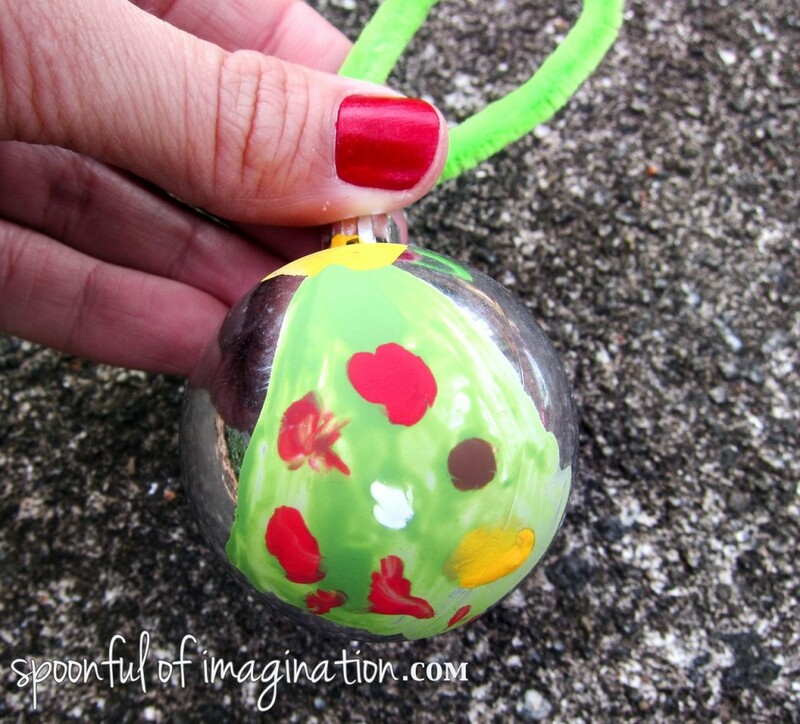 There are so many ways this ornament could be given as a wonderful present! 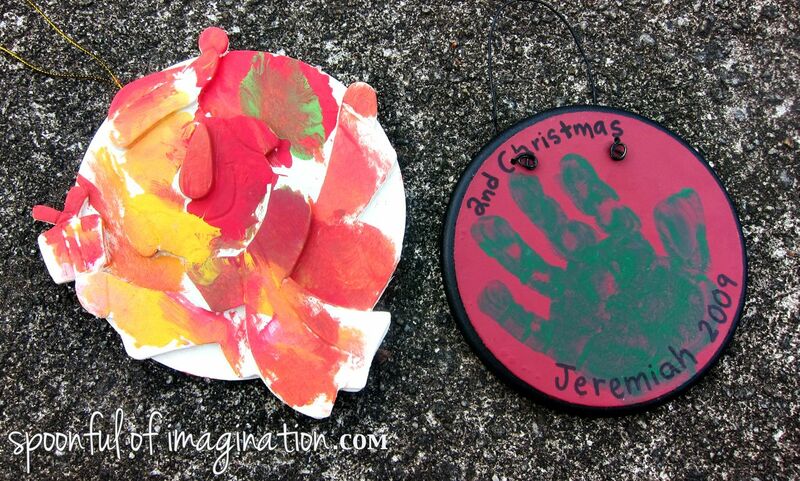 I can’t wait to make new ones for our tree for this year! You might remember from my Thanksgiving Turkey post that I am obsessed with hand prints. For this ornament, I simply stamped their hand onto a sturdy card stock, cut it out, and glued it to a coordinating color card-stock. I then punched a hole in the top and added some ribbon and bells. 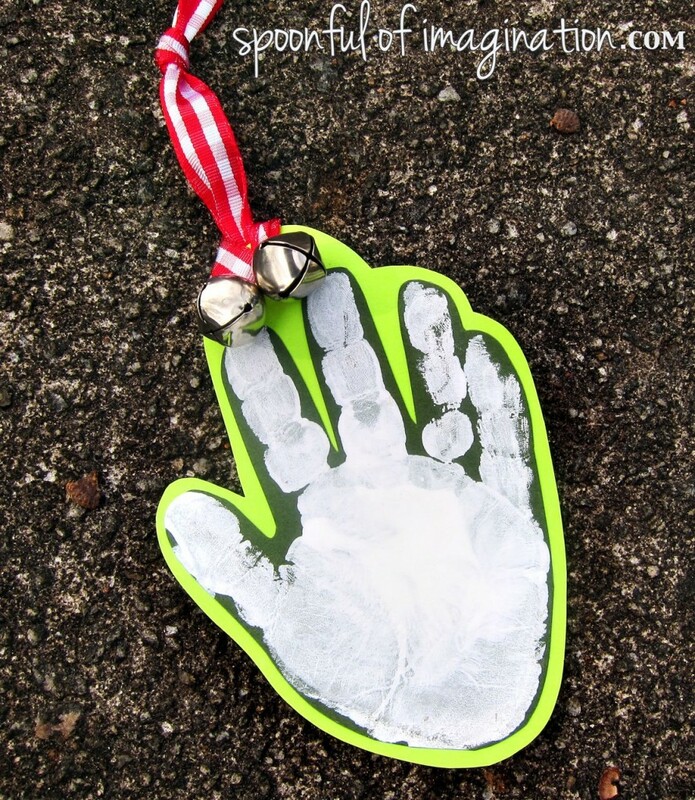 I love that it’s simple, but it captures the “year” of your little ones size hand. 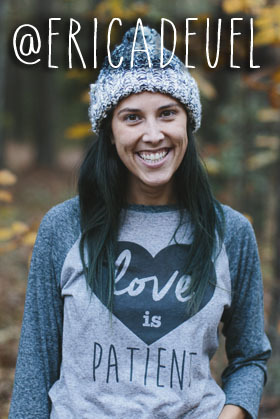 Make sure to date the back! You can get a big tube of plastic ornaments anywhere. I had a package of plastic balls that I no longer liked to hang on the tree. 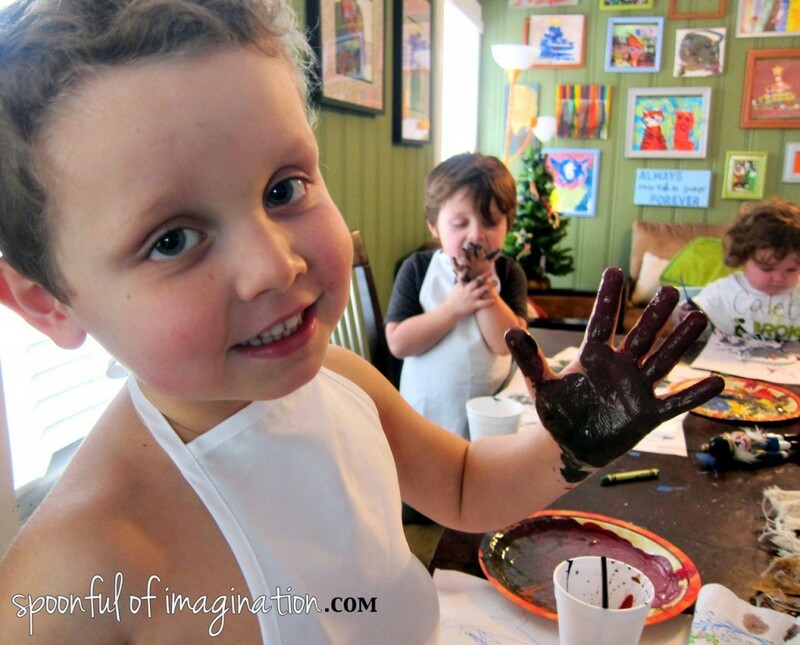 I let my kids paint them, and I all of a sudden liked them again. 🙂 We switched out the hooks for pipe cleaners, and they make great ornaments on my boys’ tree in their room. 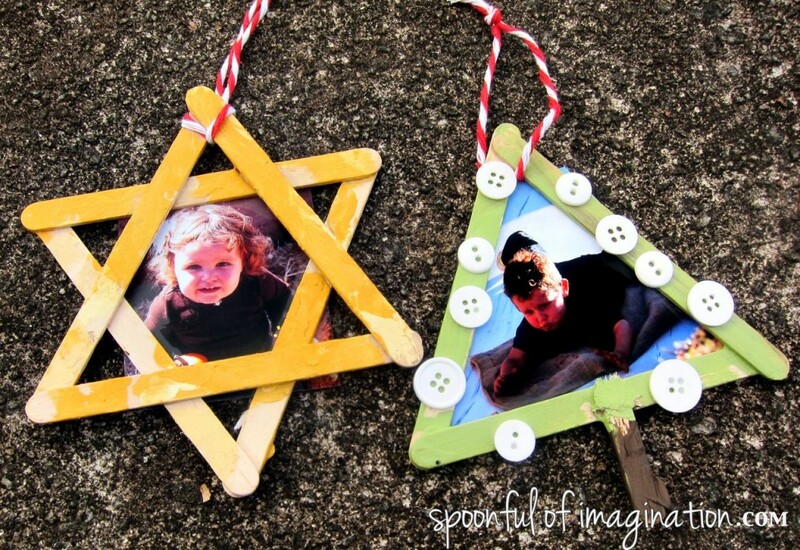 There are a lot of simple but cute wood ornaments you can find on sale at your craft store. I love to let my kids paint one every year. 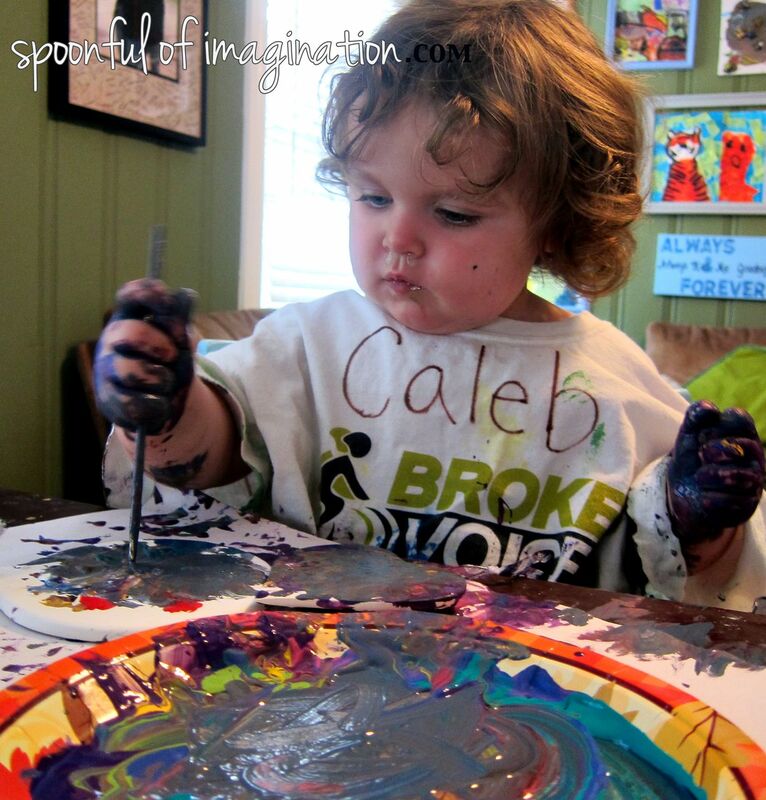 It is fun to see their growth in their painting skills to look back at previous years. 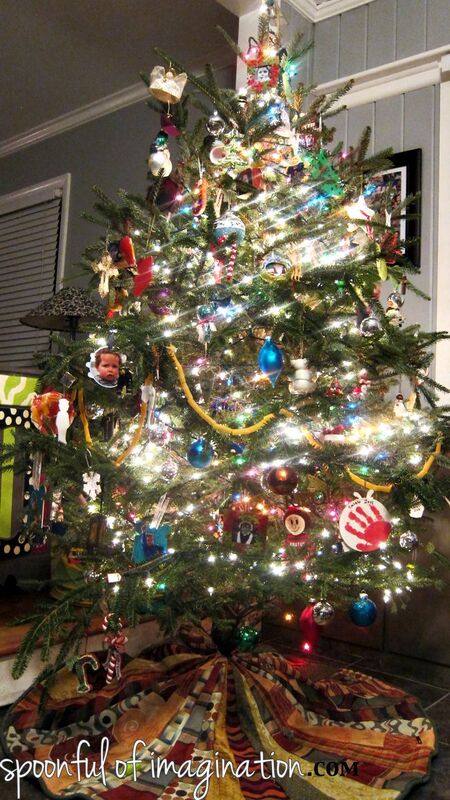 I also like to maximize the use of a tacky, kid ornament going on my tree. 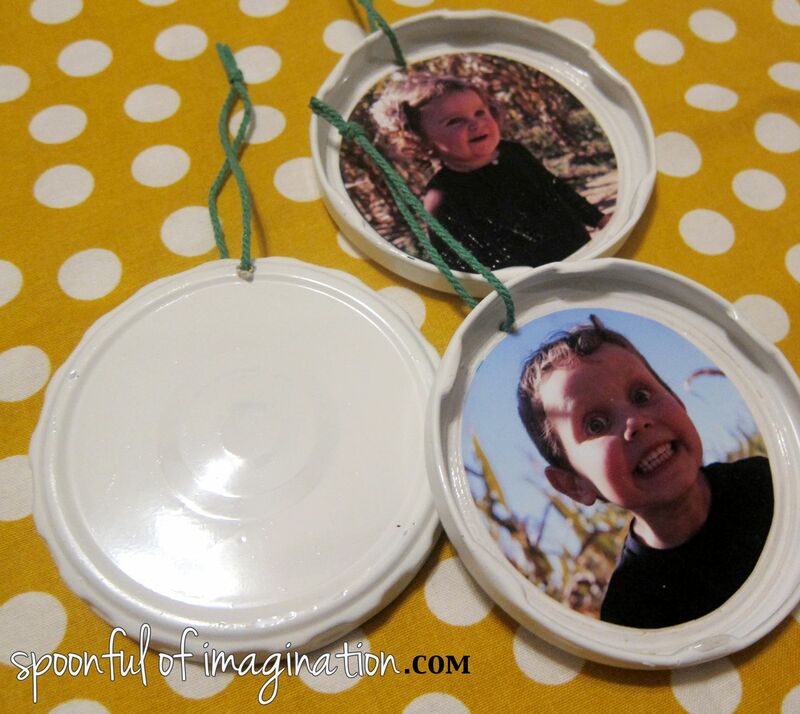 I stamp their hand or glue a picture to the back side of these ornaments, if there is room for it. 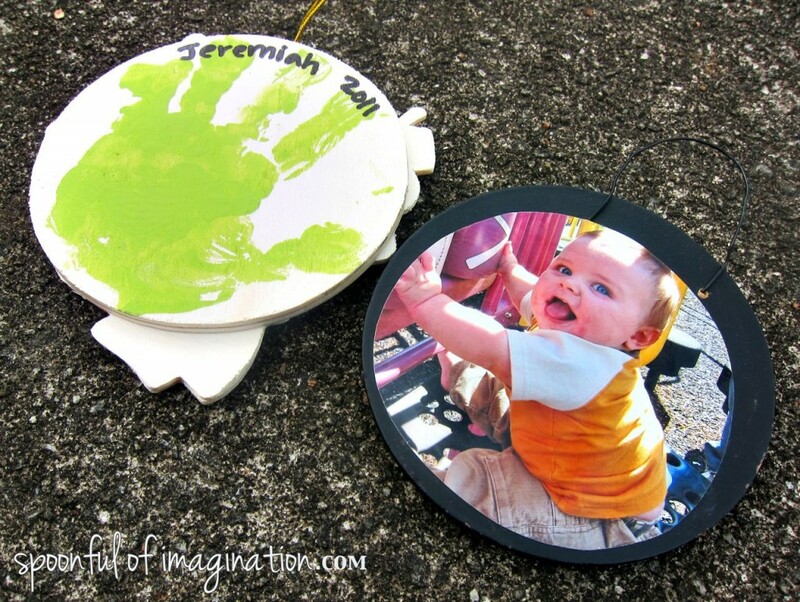 It is kind of like having an easy scrapbook to pull out every year by having ornaments that contain their art, picture, or hand prints. I love it. Right by the pre-made wood ornaments there are usually unfinished clay/pottery ornaments that you can buy. I also love to do these every year. After we paint them and let them dry, we go back and give them a good coat of mod podge and they look just like any DIY pottery ornament that you could paint at an art studio for probably about 1/4 the price. We did this same technique with our pumpkins this past fall. 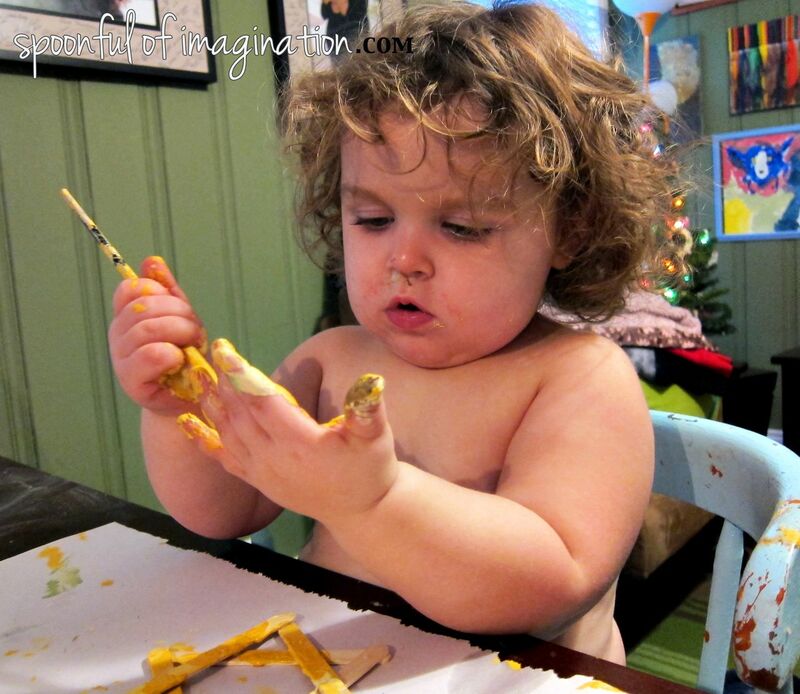 In that post, I gave you tips on how to paint with little kids. Yet, you can see from these pictures even with lots of painting practice, it is still tricky. I had to stop my four-year-old from eating paint after taking one of these pictures. 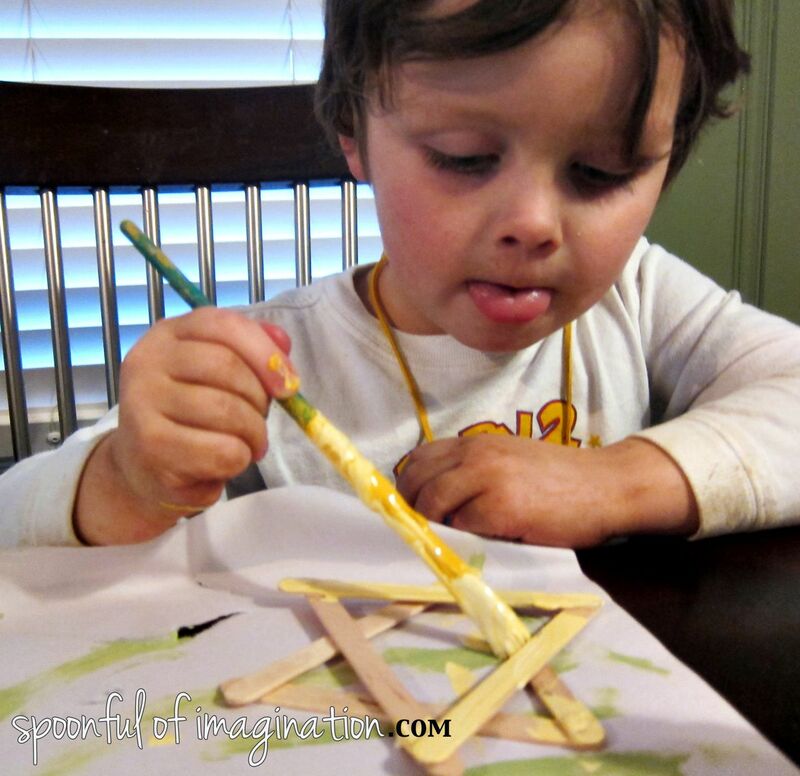 I love all the possibilities with popsicle sticks for ornaments. We have done a Christmas tree and a star so far this year. I actually love their stars probably more than my star. 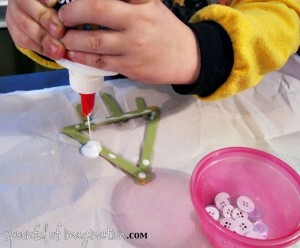 I still want to make a popsicle snow flake this Christmas season. After the glue dried holding the popsicle sticks together, they painted their trees green and their stars yellow. They then went back and glued buttons on their trees for ornaments and sprinkled glitter on their stars so they would sparkle. We simply added some pretty rope, and they were done! 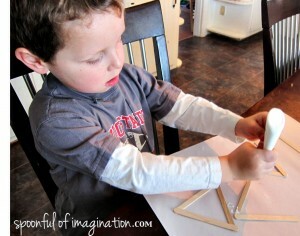 I then picked a few pictures to cut and paste to the back allowing the popsicle sticks to act as a frame. 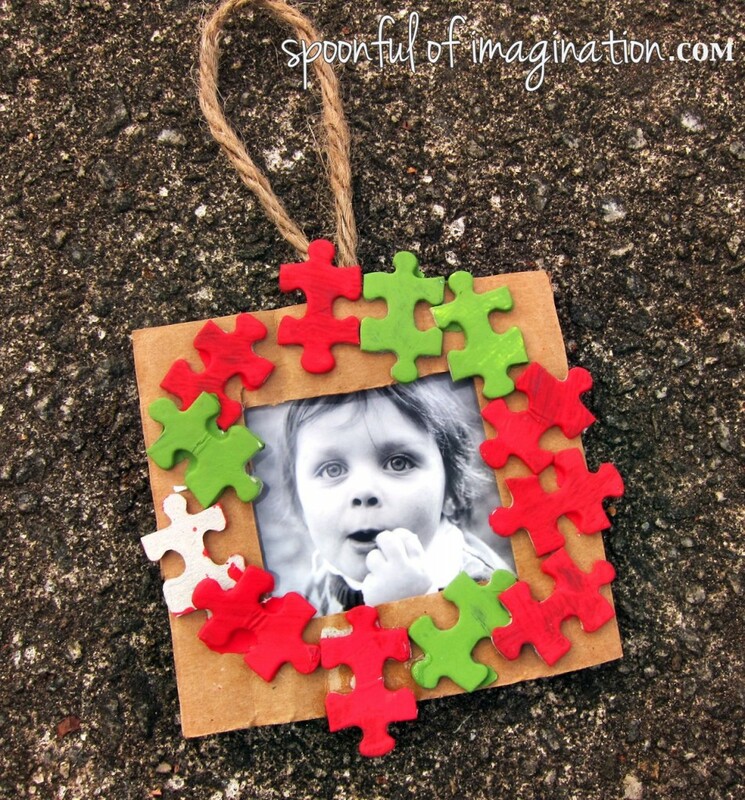 This puzzle piece ornament is another one we did last year. We got a dollar store puzzle and painted all the pieces red and green. After they were dried, I let them glue the pieces around a the construction paper “frame” that I had already cut out. Once that was dry, I glued a picture to the back and hot glued some rope on. I love the contrast of a black and white photo with the colored puzzle pieces. As you can imagine, my Christmas tree’s theme is “kid created.” I think someday I will probably have a more fashionably decorated tree, but I will probably have to have another tree with all my kids’ ornaments too! I’m sure this one will remain my favorite. What is the theme of your Christmas tree? 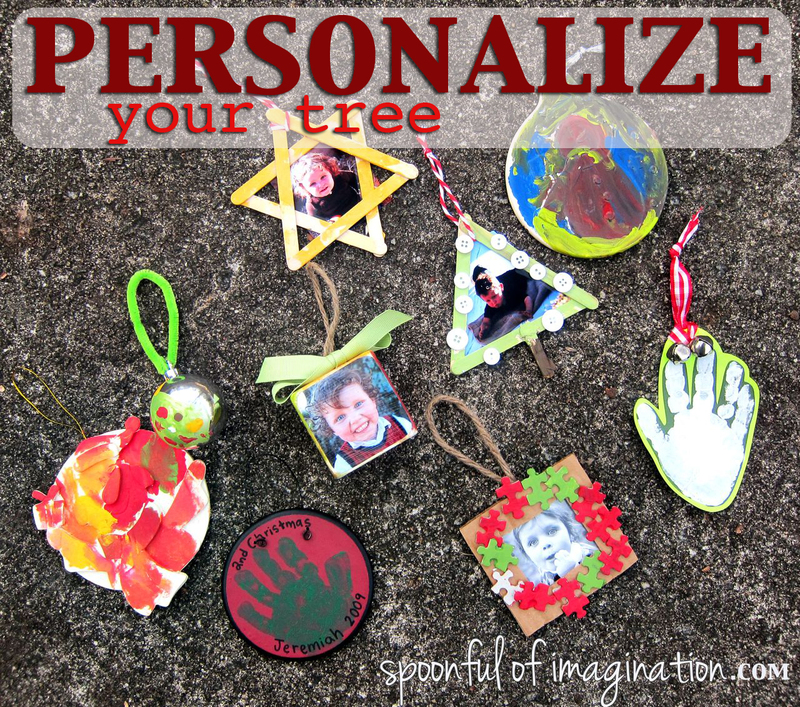 Do you make ornaments with your kids? I’d love to check out your tree. If you leave your link in the comments, I will be sure to check it out! Thank you so much for stopping by! Thank you so much Aimee for stopping by and I am flattered you want to try one of my ornaments after seeing yours! Merry Christmas!! I love the ornaments, but most of all I love your tree skirt! Did you make it out of old ties? 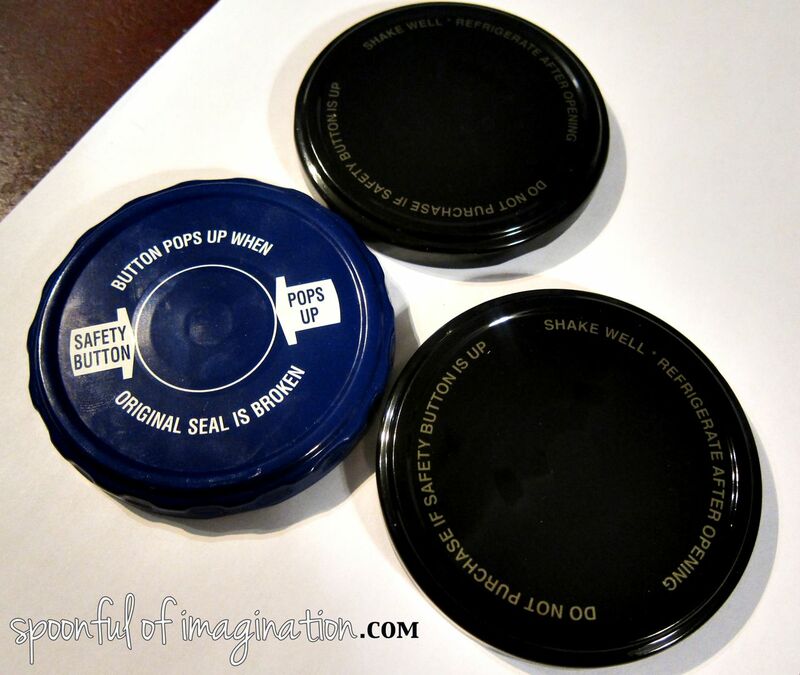 It’s very interesting and creative. Aww Thank you Susan! It’s actually made out of old fabric samples. I was given a bunch of samples that a fabric store was going to throw away, since they had new inventory. They were all pretty, but there wasn’t enough of any of the scrap pieces to do much with them. I came up with piecing them together to make that tree skirt! I’m so glad you noticed it. Thank you for your sweet words!